During the Vietnam Wat the Thai Army used Khao Cheejan mountain for its mining efforts. The stones were used at U-Tapao airport, which was at the time an American army base. After the war mining continued for construction purposes until 1976. 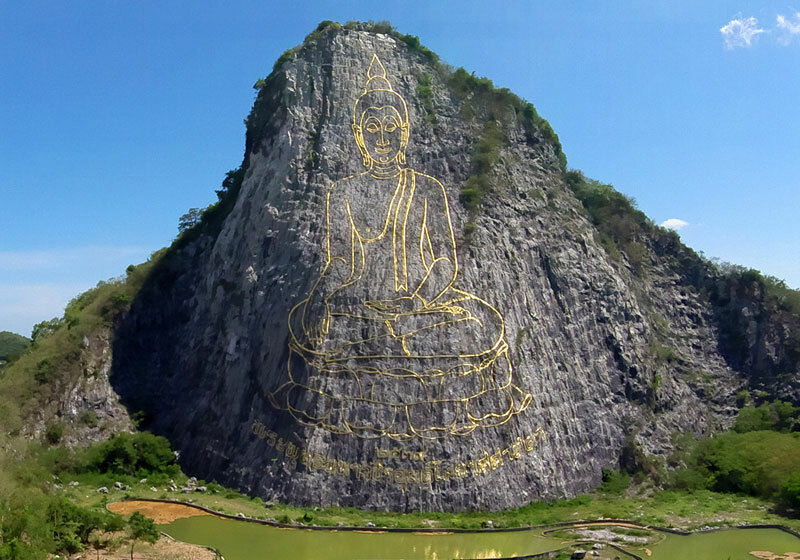 The Buddha image was carved out of the cliff using laser technology. After that, it was inlaid with gold leaf, a process that took months to complete. The impressive Sukhothai era Buddha image is 130 meters high and 70 meters wide, making it one of the biggest Buddha images in the world. Short Description: Khao Chi Chan is a famous place as it features a giant sculptural image of Lord Buddha erected on the giant cliff. It was built 1995 as initiative from then Supreme Patriarch who felt it’s such a waste to let these marble mountains were destroyed so he ordered to create the giant Buddha image on the cliff that was cut half already. It was also built to honor His Majesty King Bhumibol on the occasion of his Golden Jubilee.